In my last post about the first 14er hubby and I climbed together as part of our Summer bucket list, I SWORE (quite literally!) that I would never do another 14er ever, ever, ever again. Well, obviously this post isn’t about a 14er I didn’t climb, so that means I ended up climbing another 14er. Silly me! When we last left off, Pie and I had successfully climbed Grays Peak, but it was not a pleasant hike at all and I didn’t want to leave our 14er-hiking-experience off on a bad note. I decided we needed a 14er do-over and I forced convinced hubby to do another 14er with me. 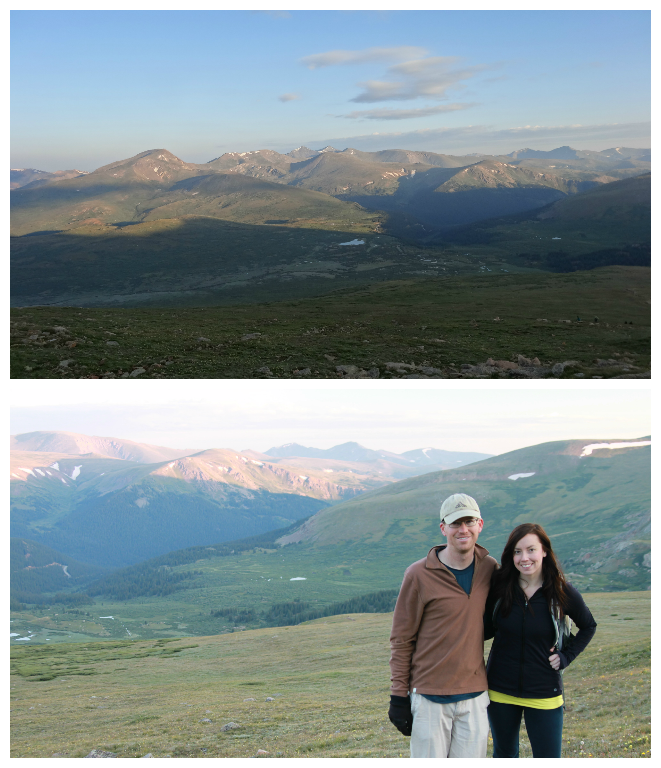 Not only did I insist on a 14er do-over, but I insisted we get up on a Sunday morning at 2:00am to do our next one. Oh, and I decided all of this the Saturday night before. 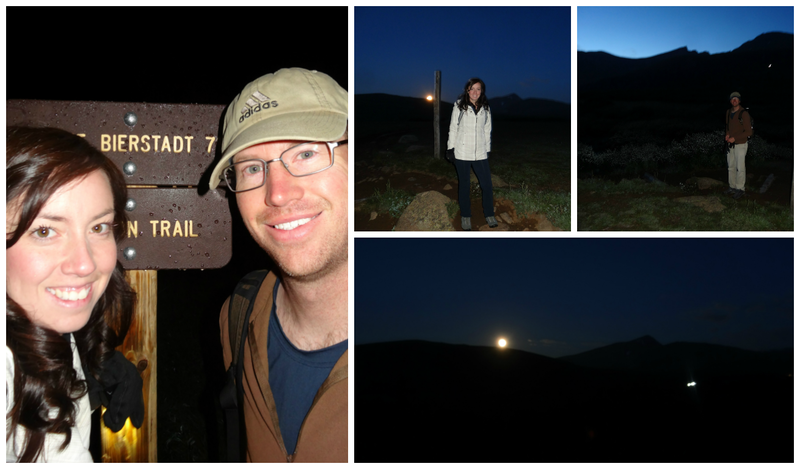 I told hubby that it was fun to be spontaneous and plan a last minute hike to get up in the middle of the night. After all, we are still quite young (and childless) and there wouldn’t be many other times in our lives when we would have this kind of open opportunity to do something slightly crazy! He wasn’t really buying this pitch though. My other reasoning behind getting up so early also had to do with the ridiculous amount of crowds we dealt with during our first 14er. I always expect hiking to be a serene, peaceful experience and an opportunity to get away from people, not encounter hoards of them! 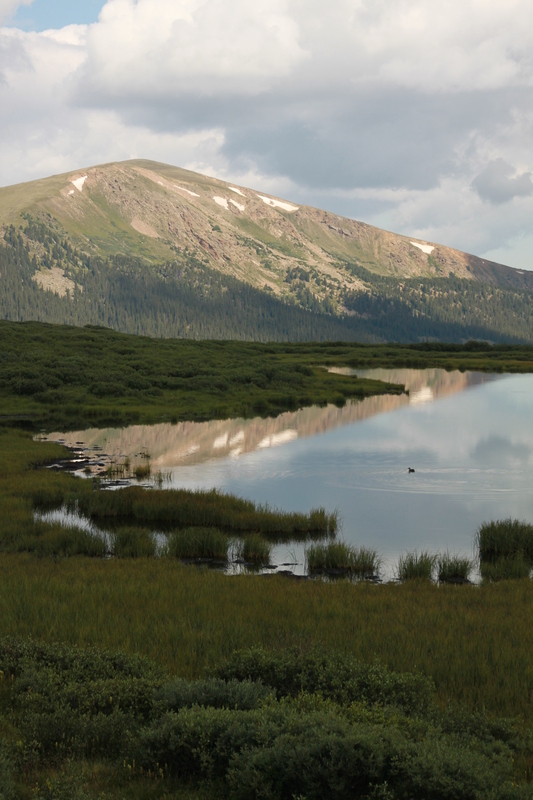 Grays Peak and Mount Bierstadt are some of the most popular 14ers in Colorado because they are both close to the big city of Denver and relatively easy. This makes it kind of hard to avoid the morning 14er rush hour — since everyone wants to get up and down the mountain early before the afternoon storms come in — but I was determined to start hiking before the trail became a super highway, even if that meant hiking in the dark! It’s no surprise that I didn’t end up getting up at 2 am but I still got up pretty darn early. Since hubby was not completely on board with the idea of getting up so early in the morning or doing a hike at all that day, I woke up at 2 am and hit the snooze button several times, contemplating how badly I wanted to do this 14er. I ended up over-thinking the subject so much that I couldn’t really sleep anyway, so I eventually got up around 2:30 am. Hubby slept in peacefully for another hour and got up around 3:30 am when he realized I wasn’t kidding about hiking so early. As we were getting ready to leave, we were surprised to hear thunder and didn’t really believe it until we heard it a second time. At this point, I realized that I hadn’t even bothered checking the weather forecast the night before, assuming that if a customary mountain storm did pass through, it would likely be later in the day after we were getting off the mountain. The actual sound of thunder and sudden realization that we might get poured on at the very start of the hike was causing me to think twice about this whole adventure in the back of my mind. We didn’t back out though, and instead, I decided it would be wise to just prepare for the worst. I traded out the trail running shoes I had originally planned to wear for clunky, waterproof hiking boots. I also remembered this time to bring gloves for the cold, along with a long-sleeve wool top and a raincoat. I was packed up and prepared for whatever this hike brought! We left the apartment shortly before 4 am and the sky was practically clear, but drops of rain fell on our vehicle as we drove out of the parking garage. At that moment, I think Pie and I both wondered what we were thinking leaving for a hike in the pitch dark of the morning while a storm threatened. It was too late to turn back though since we had already dragged ourselves out of bed with our sights set on conquering a mountain that day. We reached the trailhead shortly after 5 am and there were already about 10 cars in the completely dark parking lot. It was not unexpected that there were already cars in the parking lot, as we had read reports of people starting their hike at 2 or 3 in the morning in order to reach the summit by sunrise. In fact, as we began our hike, we noticed a few lights in the distance to where we were headed. A couple of the lights were not that far up the mountain, but some were bobbing on the saddle of the mountain, about to reach the summit. My initial goal had also been to reach the summit by sunrise like those tiny lit-up dots on the top of the trail, but this was obviously now an unrealistic goal because I decided to hit the snooze button several times before actually getting up and we didn’t get to the trailhead until about an hour before sunrise. I was kind of bummed about this, but then realized it was quite a feat that we got up at all that morning to climb a 14er. So I gave myself a metaphorical pat on the back and hiked on in the dark. Hiking in the dark that morning was actually quite pleasant. We were not running into hoards of people, it was incredibly calm and quiet, and we had prepared much better for the cold this time. It was exactly the kind of hiking experience I needed to get through a 14er-do-over. We found our way to the start of the trail with lights in hand, feeling like badasses that we were hiking in the dark until we realized we actually didn’t need the lights at all and we might look tougher without them. The cloud-less, moon-accompanied sky was bright enough to outline the trail for us without the use of lights. So we walked the first few miles of the trail in the dark, occasionally stepping in soggy mud puddles until an hour later when the moon began to set behind the mountains behind us and the sun began to rise from the very mountain we were hiking toward. Around this same time that the sun began to rise was when the hike first started to get steep. Up until now, I had been hiking very cheerfully with a bounce in my step, confident that this hike would be much easier simply because I was in a better mood. That feeling quickly went away when the hike became a real hike with my calves burning and my lungs begging for mercy, yet again. 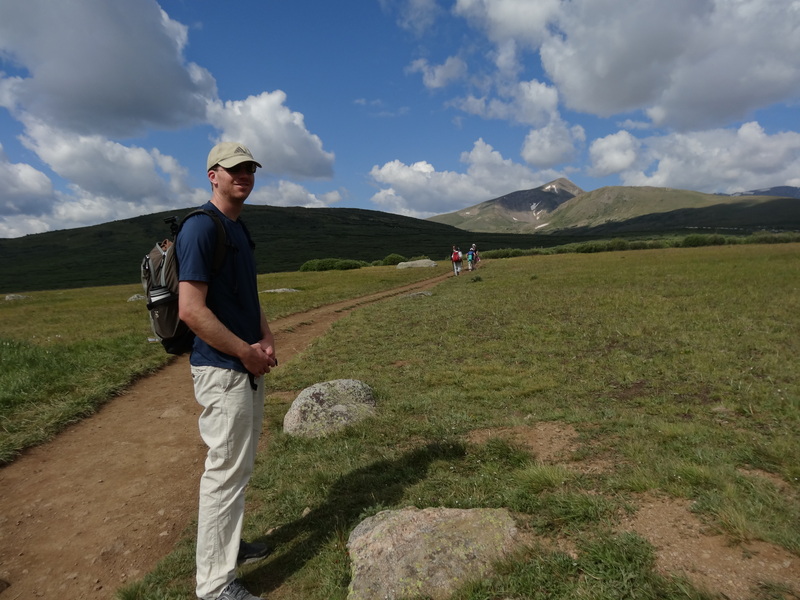 I began to feel a little bit discouraged that this hike might be as equally challenging as the last and that maybe I just wasn’t going to enjoy hiking any 14er. I trucked on, reminding myself that no matter how bad it got, I just needed to be nice to the mountain and not curse it as much as I did the last one, and maybe I would still come out of this with a better experience. Seeing that the skies were very clear that morning and no rain storms loomed in the distance, I regretted wearing my heavy hiking boots. I reasoned that the hike would have been so much easier if I had just stuck with my usual sandals, or even the lightweight trail running shoes I had originally wanted to hike in. However, I was glad that I had brought gloves and a jacket that I mainly wore at the beginning of the hike. These were worth the extra weight to carry around! 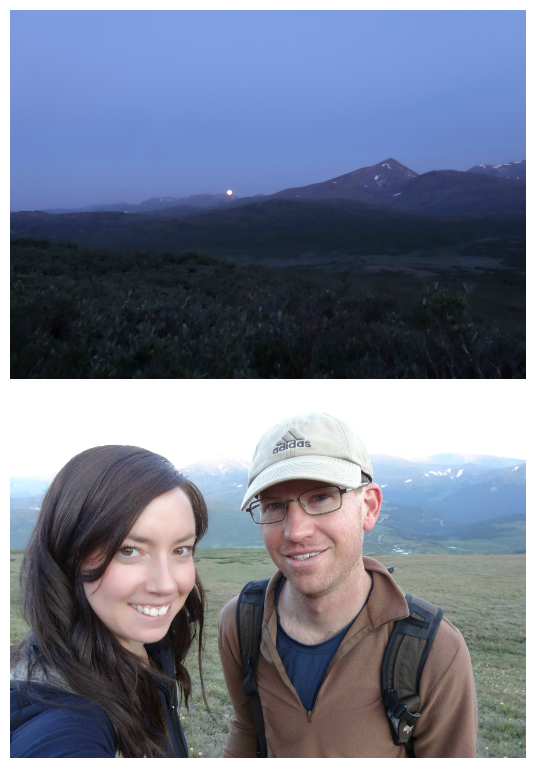 The sun starting to rise on the mountains behind us, about an hour into our Mount Bierstadt hike. 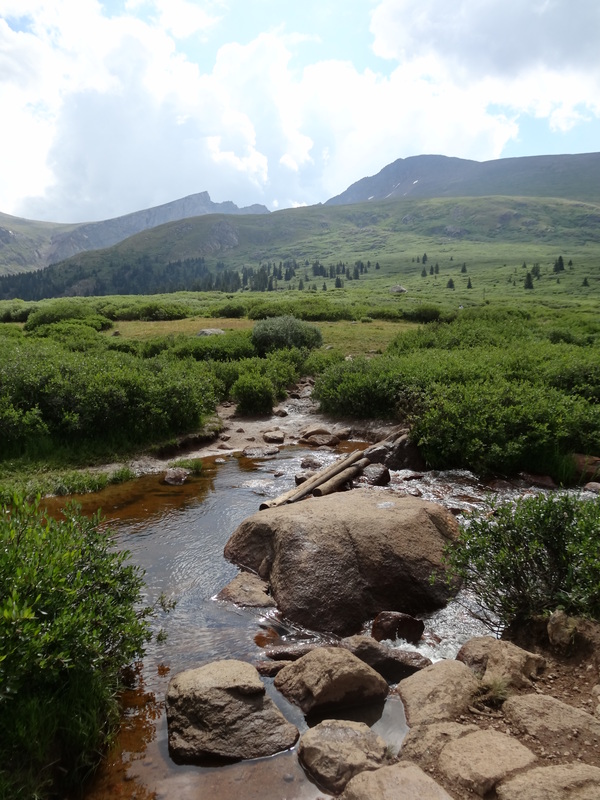 The steep trail, with Mount Bierstadt in sight on the right and “Sawtooth”, the jagged arete, on the left. Besides spotting a fox cross the trail right in front of us, the the rest of the hike up until the final stretch was very uneventful, which was a good thing! Although the hike was strenuous, it ended up being not nearly as strenuous as Grays Peak and not nearly as bad as I predicted earlier in the morning when the trail first started to get steep. This trail also did not have even half the amount of loose rock that the hike on Grays Peak had. This made our feet very happy! Can you spot the fox? 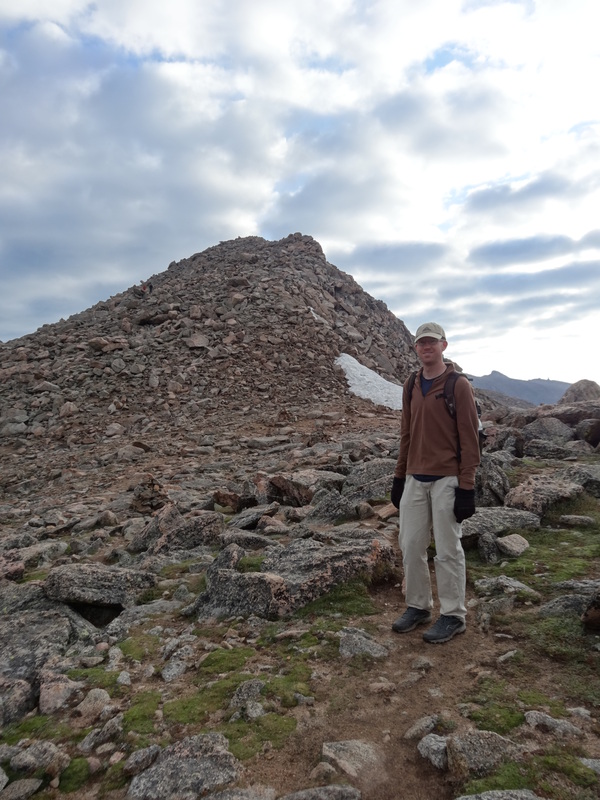 Nonetheless, I was still pretty tired when we reached the final, most steep stretch to the top of Mount Bierstadt, the boulder field. I had heard stories about the boulder field being the least pleasant section of the hike and was really worried about climbing big, loose boulders. 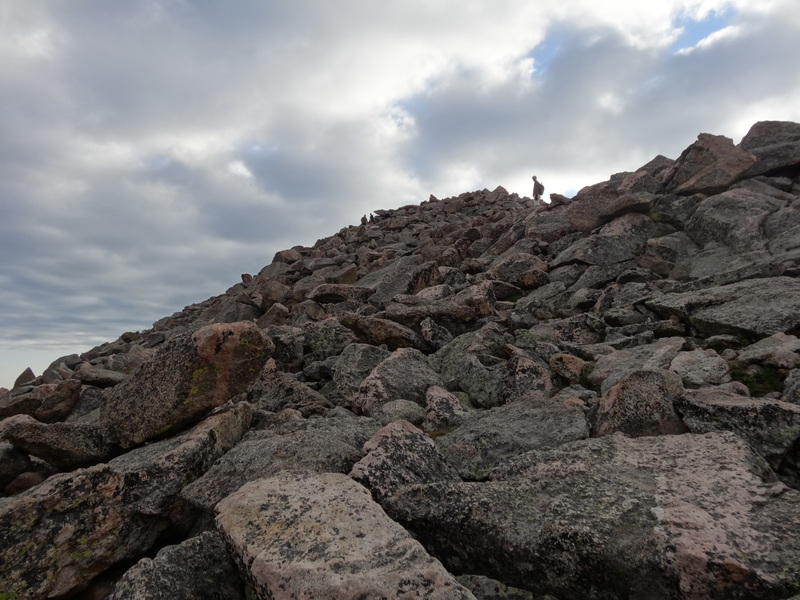 However, the boulder field ended up being relatively easy in comparison to the final section to climb on Grays Peak. Most of the boulders were actually very stable and easy to reach from one to the next. Best of all, it felt like a short, straight climb to the top, unlike Grays Peak, where the final part of the hike included an endless amount of switchbacks covered in small, loose rock. It was a big relief to find very little snow at the top because snow is never a fun thing to hike on when you are tired. There was a small patch of snow on the saddle, but none anywhere else. On the saddle, ready to head up the boulder field to Mount Bierstadt. The peak was much further than it looked from this angle. Pie had no problem climbing these boulders to the peak as you can see how far ahead he was. I think he’s part mountain goat. 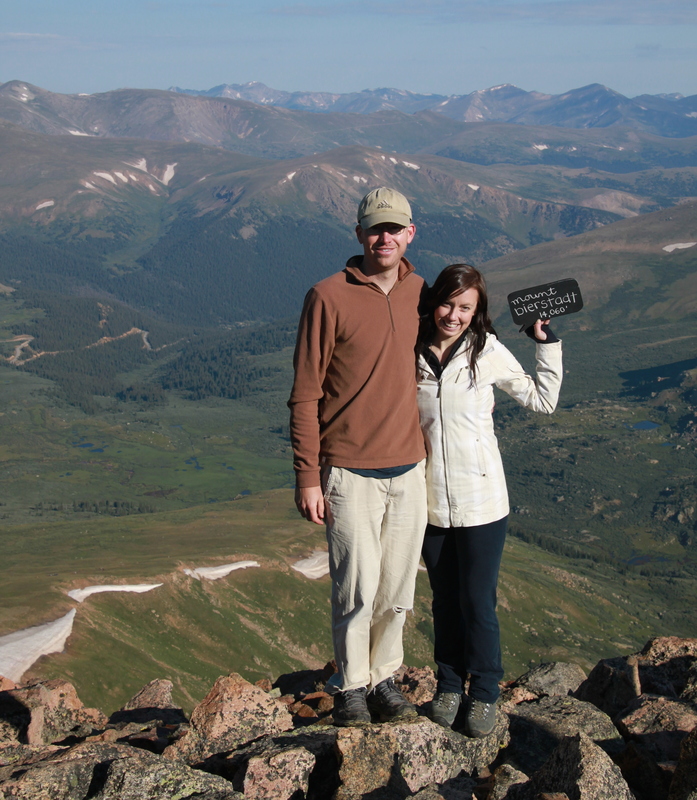 We finally reached the top of Mount Bierstadt shortly after 8 am, making the hike up exactly three hours. We did not have a bottle of wine to enjoy at the top of this 14er as we had on Grays Peak since we had to sacrifice celebration libations for extra layers of clothing. We had reached the top of the mountain so early in the morning that we didn’t really lament on the fact that there was no wine to celebrate with. 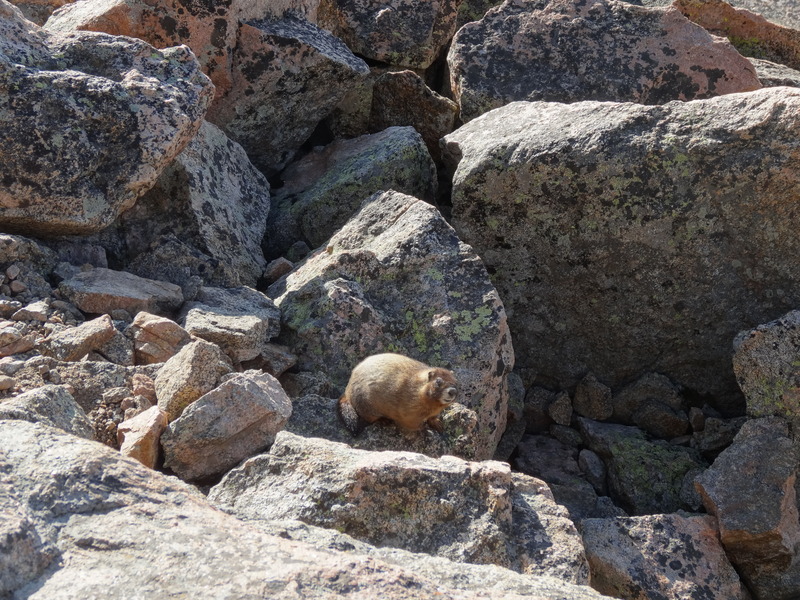 It was cold and breezy on the top of Mount Bierstadt, so we hastily took some photos and refueled with sandwiches (as a marmot eyed our food from only a few feet away). 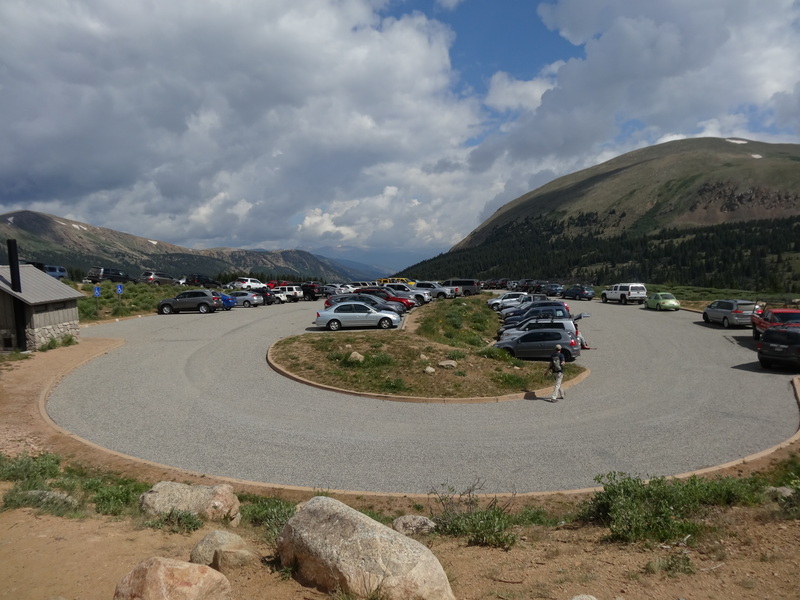 From the top of Mount Bierstadt, we could see that the tiny parking lot that earlier had only a few shiny dots in it now had shiny dots lined all the way down the road leading up to it. We knew if we lingered around any longer at the top of Mount Bierstadt, our peaceful and serene hike would be spoiled by the incoming crowds. And we were right about this! As we hiked back down the boulder field, we found it difficult to not only zigzag around the boulders to find a good one to step down on, but we found it difficult to also zigzag around the people coming up. 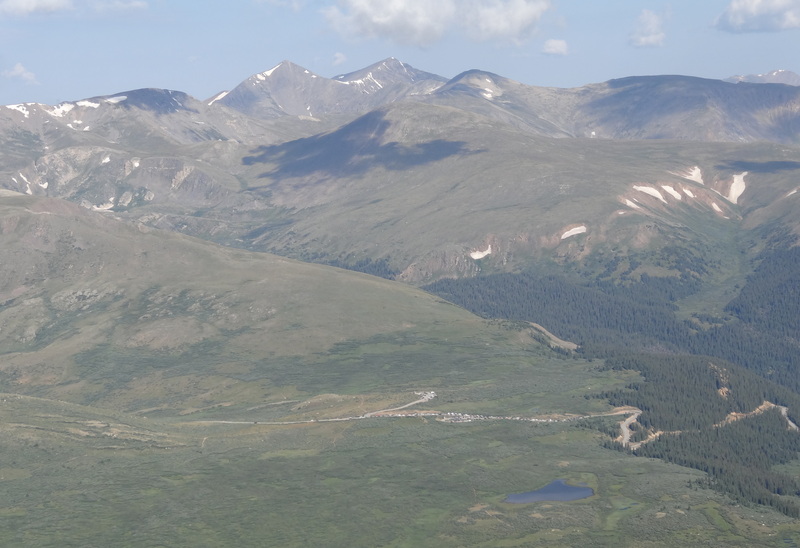 When hubby and I had hiked up, we saw no more than 10 people that had passed us on the trail, but now as we were heading down, there were an immeasurable amount of people heading up (although still not as many people as we had seen on Grays Peak). 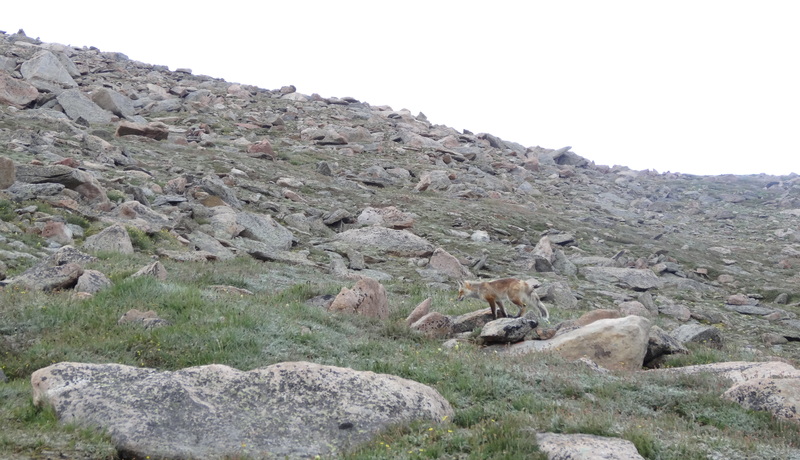 Even though there wasn’t a set path to follow up the boulder field, most people tried to head up the same way – the shortest and most direct way – so it was easy running into other people on hike through the boulder field. Can you spot the parking lot with shiny cars lined all the way down the road? A trail of people (like ants) headed up the boulder field as we were headed down. The rest of the hike back down was very quick and easy. The only slightly challenging part was crossing a stream that we had already crossed earlier in the morning in the darkness. It was no easier crossing it in the daylight than it had been in the darkness. We also took a moment to stop at a lake that we had not seen earlier in the darkness of the morning. Surprisingly difficult stream to cross. Before we knew it, we were back at the trailhead where we had been exactly five hours before in the dark. Although our 14er-do-over had been a successful and happy one, hubby and I still pondered if it might have been beneficial to camp at the trailhead the night before, not only to get an early start on the hike, but as an attempt to get acclimated to the high elevation somewhat. Either way, we were glad we had gotten up early and climbed a mountain before most people were awake that Sunday morning.